Polymer_ splashed into Spring with their SS/19 launch party and art show on March 16. With more than 200 attendees spilling into the street, the label showed off their new 1,300-square-foot studio in the Wrigley neighborhood. As a Long Beach resident for more than two decades, Basangan’s passion to create a brand and platform for the creative community has been a long time coming. The original headquarters was a 1957 Franklin trailer, which doubled as a mobile shop, but soon it became clear there needed to be a permanent showroom. Flanked by Managing Partners Ryan Russell Ward, Chris Velasco and Jonathan Blua , Basangan said they wanted the brand’s location to be an organic representation of the community, it’s lifestyle and the individual’s daily passions. 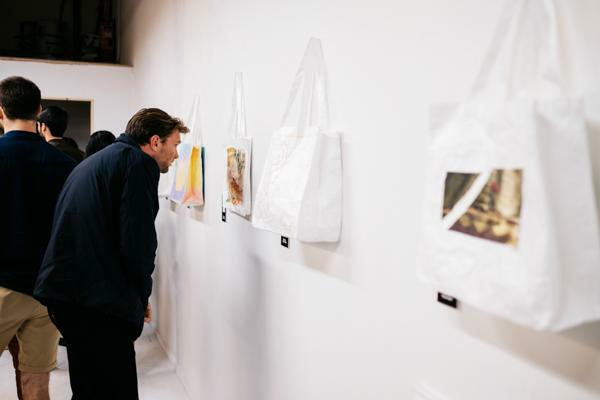 This collaborative mindset spilled into the event, featuring over 20 local Long Beach artists who used Polymer_’s Tyvek tote bags to create a unique piece of art. The bags are available for purchase with all proceeds to benefit both the Surfrider Foundation and Marine Mammal Care Center of Los Angeles. To learn more about donating to these charities or to purchase a bag, email info@thepolymer.com. Attendees also enjoyed signature beers by local brewer Ambitious Ales while rock band Spirit Mother performed between vinyl sets by Christine Mai Nguyen. Enjoy these party photos and give Polymer_ a follow to stay current on happenings at the brand. The new office is open for business! Nothing but people truly enjoying themselves! Braided, faded, and chains out! The classic art show beer line...don't forget to tip your bartender! Friends and family all around...is that a GRBG made hat? Long hair whips throughout the set! Supra footwear's Joe Donovan...Thanks for the Gold kicks my dude! Spirit Mother got them in a trance! Danny from Ezekiel was in the building! Ain't no Long Beach party without the doggs!